TOPMORE, Taiwan’s leading designer of high-end electronics, proudly presents Crystal Cube, a set of portable Bluetooth speakers that are held together by magnetic connection. Stylishly designed, each of the two speakers in the set features transparent, crystal-like casing and a light, compact body. 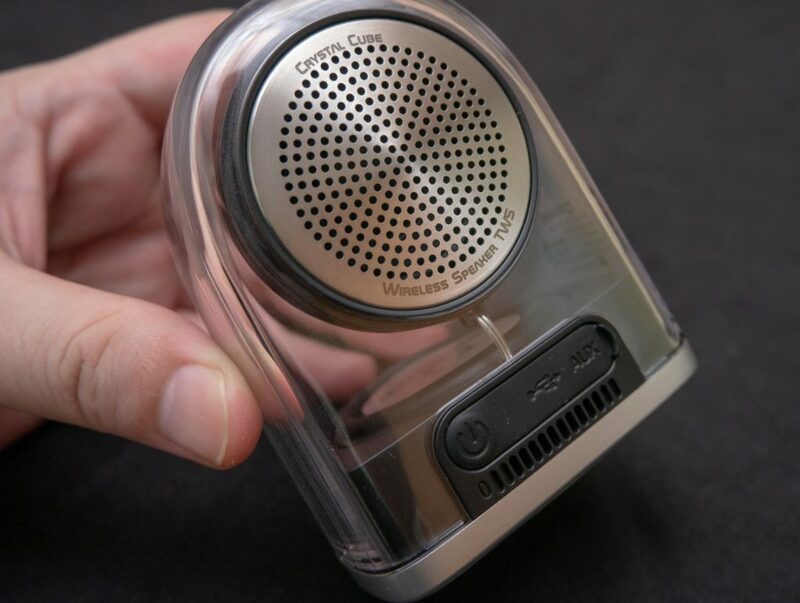 The individual speakers also have a magnetic base that allows them to be put together as a self-contained, capsule-shaped device. With this modular form factor, the speakers can be easily taken to different venues. In addition to its beautiful appearance, Crystal Cube provides high-quality audio performances and brings great music listening experience to wherever it goes. The most incredible feature of Crystal Cube is its ability to transform into two speakers that can operate individually via Bluetooth. 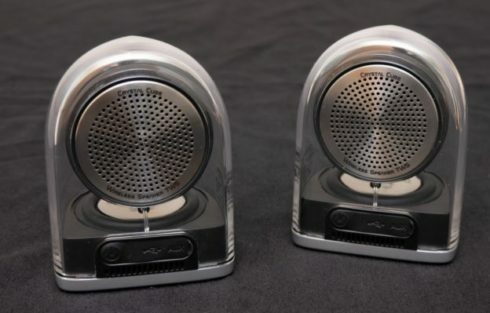 At the same time, the two speakers can work together as a two-channel stereo system. The magnetic base of the speakers is specially designed to be strong enough to hold firmly onto most metallic surfaces. Hence, they are built to perform while moving from places to places. 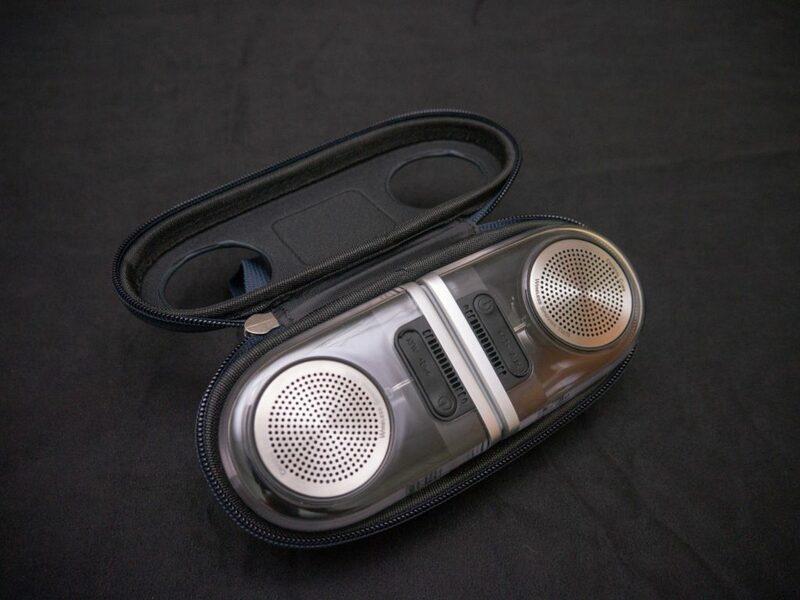 Furthermore, the speaker set comes with its own leather carrying case so that it can be set up in an outdoor setting. The leather case can also be fastened to a backpack or mounted on the rear rack of a bicycle for traveling. ▲ Just like the product inside, the packaging of Crystal Cube embodies TOPMORE’s spirit of luxury design. 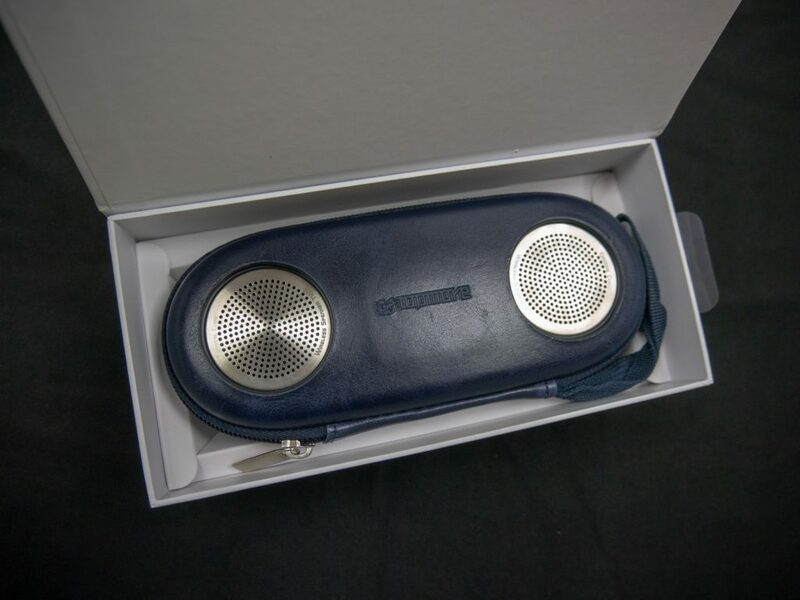 ▲ The speaker set comes with a navy blue leather carrying case, a two-headed USB cable for charging, and a user guide. ▲ The length of the wrist strap allows Crystal Cube to be held comfortably by hand. The carrying case can also be attached to a backpack or mounted on a bicycle’s rear rack or handlebar. ▲ The carrying case contains layers of materials that can protect Crystal Cube against impact and shock. ▲The strong magnetic base of the speakers allow them to join together tightly and form a mini capsule. ▲ One major advantage of Crystal Cube is its simplified design for easy operation. 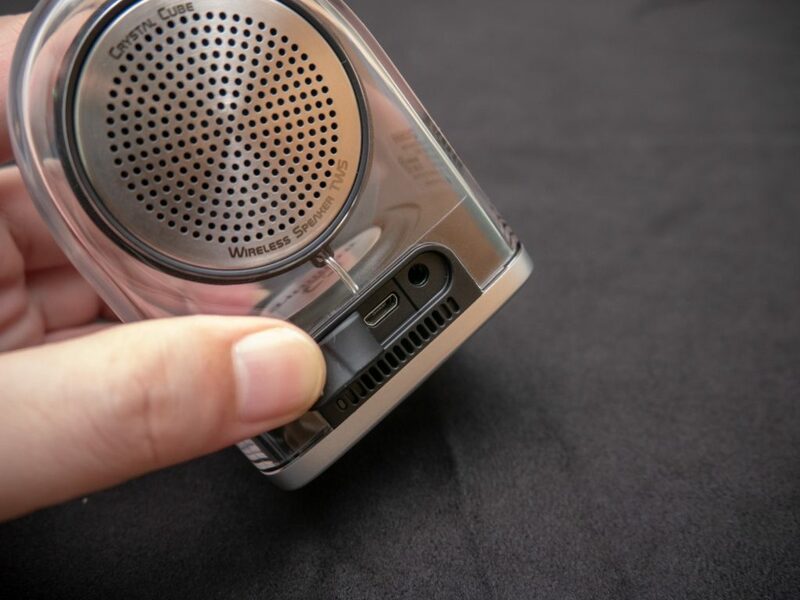 The front of an individual speaker features a switch for turning power on/off and activating Bluetooth, a USB port, and a 3.5mm socket. ▲ The charging cable is based on the microUSB format and has two heads to charge both speakers at the same time. The speakers are also compatible with conventional microUSB cables from other brands. 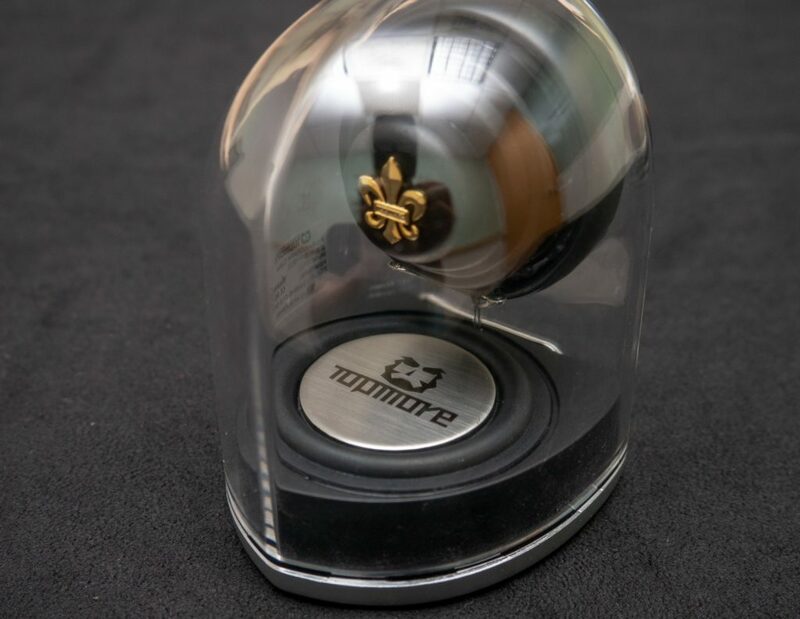 ▲ The transparent body casing conveys a sense of modern simplicity, while the fleur-de-lis motif that is on the back of the speaker gives off an air of royalty. Crystal Cube conceals a wide breadth of engineering content under its sleek, minimalist design. Each of the two speakers contains a high-capacity battery that provides a continuous music playing time of up to 8 hours. To provide additional convenience, users can check how much battery is left on the individual speakers via their smartphones or tablets. 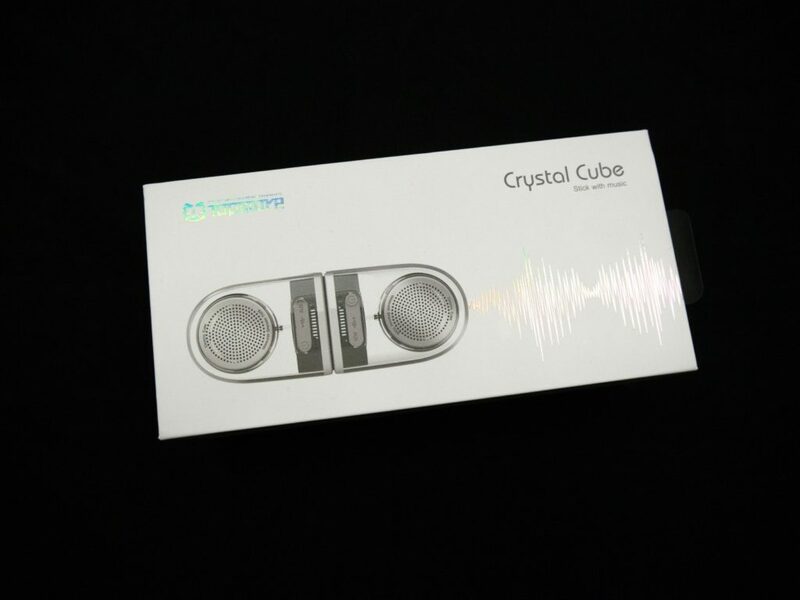 The wireless protocol that Crystal Cube uses is Bluetooth 4.2, which ensures stable and smooth music playing. During the development of Crystal Cube, TOPMORE sought expertise from a top-tier international brand in sound systems. Specialists from this major audio company were responsible for the fine tuning of the speakers, which feature unique cavity design and large-size 20mm voice coils. Together, the two speakers can achieve dual 5W output, thus maintaining excellent sound quality despite their small form factor. Crystal Cube can provide 360° surround sound for the best listening experience. Thanks to the tuning by industry specialists, the compact Crystal Cube can deliver the desired tones for all genres of music and exceptionally handle the musical and vocal ranges. Crystal Cube offers clear and deep sounds so that listeners of classical or marching music can hear the drums and tubas. It also offers strong beats so that listeners of EDM can quickly pick up the rhythms. The speakers clearly define and amplify the sounds from all types of musical instruments, including those in the middle of the music range and those playing the accompanying low-pitched tones. Likewise, Crystal Cube is able to present the nuance of each note accurately in the vocal range without muddling. From the speakers, listeners can discern the subtleties of a high-pitched singing performance as well as the flowing details of an orchestral performance. Whether the sound is a low hum or a high screech, Crystal Cube can faithfully reproduce it. 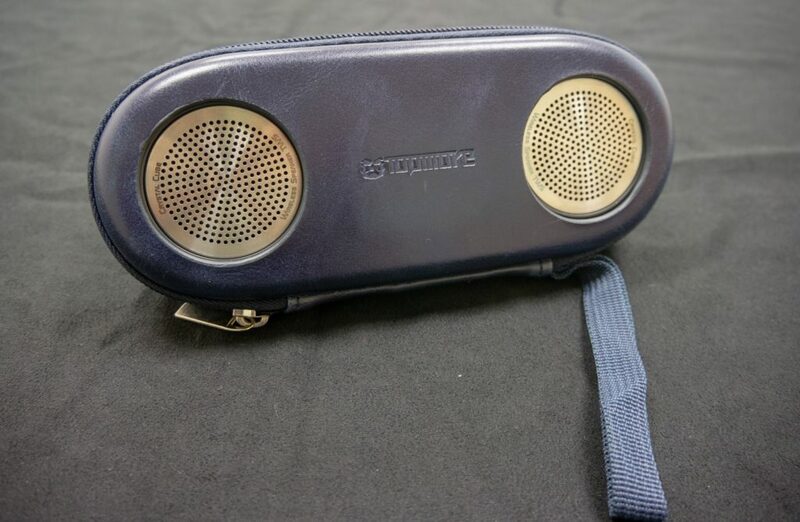 Audiophiles can depend on this portable speaker system to reveal the crisp, high tones along with other complexities when playing classical music, operas, popular music, and music of other genres. The minimalist design simplifies the operation of Crystal Cube by eliminating unnecessary steps and procedures. It can be easily connected to smartphones and computers that feature the standard Bluetooth technology. A single speaker of the system will automatically enter the device detection and pairing mode with a long press on the power switch. In the same way, that single speaker will automatically connect back to its paired device nearby after being turned on again because the device is registered in its memory. Activating the stereo mode that uses both speakers is also very easy. Before pairing with the smartphone or computer, a long press on the power switch of one speaker to turn it on, followed by the same action on the other speaker, will enable the stereo mode. Crystal Cube will automatically configure the left and right channel so that they will work together. As the name suggests, TOPMORE Crystal Cube combines the minimalist, transparent design with the premium audio performances made possible by a major international brand in sound systems. The integration of portability, long battery life, and separable modular design allows the enjoyment of music indoor, outdoor, and on the move. Apart from the efforts in perfecting the details of the product design, TOPMORE has employed industrial professionals to develop the unique support for high-quality audio effects. As a cutting-edge manufacturer of high-end electronics, TOPMORE hopes that Crystal Cube will dramatic enhance music listening experience of its users as they go about with their daily activities.